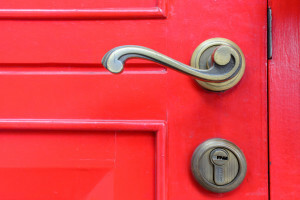 Front door hardware might seem like a small detail in the overall appearance of your home, but as the focal point of the home’s front door, it is truly at the center of the first impression that a home gives. The hardware that you choose for your front door is based on style preferences, desired security features, and what your particular entry space can offer. Here is a quick overview of the various styles of entry hardware available for front doors so that you can make an informed decision about which styles and features will work best for you and your home. Tubular is one of two main hardware styles for your entry doors (the other style being mortise.) A tubular lock has the latchbolt and deadbolt set in two different holes, with the latchbolt itself incorporated within a knob, lever, or handle. You might find tubular entry door hardware in the form of two detached metal pieces for your door, or you might find both the latchbolt and deadbolt set on a single metal plate (escutcheon). Tubular entry sets for your front door will often feature a deadbolt and handle-style latch on the outward-facing side with a corresponding deadbolt thumbturn and knob or lever on the inward-facing side. Mortise is the other of two main hardware styles for your entry doors. Mortise locks have the latchbolt and deadbolt both encased in a steel box that fits in a single hole, which can often make door hardware replacement simpler as the hardware need only over one hole. These locks tend to have more features as well, which can make them more expensive than tubular locks. A mortise entry set, like a tubular entry set, will often feature a deadbolt and handle-style latch on the outward-facing side with a deadbolt thumbturn and knob or lever on the inward-facing side. However, there are also knob-by-knob and lever-by-lever options for these entry sets. In addition to these key-operated locks, you can also opt for electronic locks for your front door. These locks might feature a keypad with only a deadbolt; a keypad with both a deadbolt and a latchbolt; or a keypad with only a lever. All electronic locks will feature a key-in function as well, just in case there is a power outage or the lock ceases to function.